One of the more interesting applications of peer-to-peer finance is the concept of a prediction market - a market where people can speculate not on stocks and commodities, but rather real-life events. 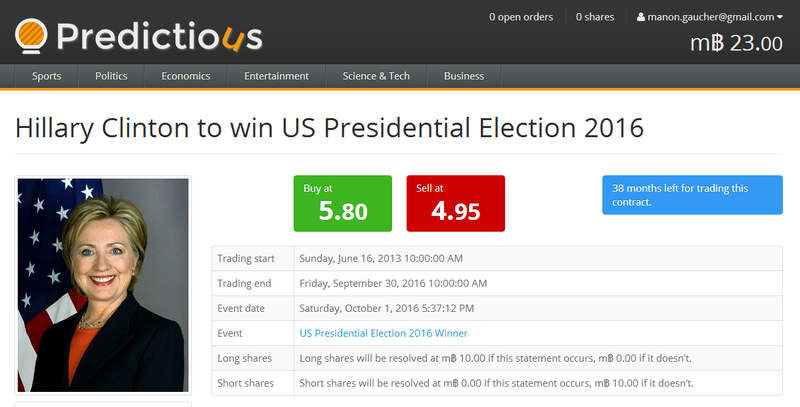 A prediction market might issue an asset that pays out $10 if Hillary Clinton wins the 2016 US presidential election, and $0 otherwise, and people would be free to either buy or sell the asset (short selling, or selling shares that you do not own to have a negative exposure, is just as easy as selling). The asset would then find a natural market price, say $2. If you think Hillary Clinton has more than a 20% chance of winning the election, it is in your interest to buy, and if you think he has less than a 20% chance then you can short sell. The idea is that, through the mechanism of the market, the opinions and information of millions of people around the world would be brought together to determine a sort of public estimate of the probability that something would happen. What is even more interesting is that even secret information would be brought into the calculation; if, for example, you secretly know that Hillary Clinton already has established plans to retire by then, you can short sell a large number of shares without telling anyone why, and your short sales will make the market price go down. 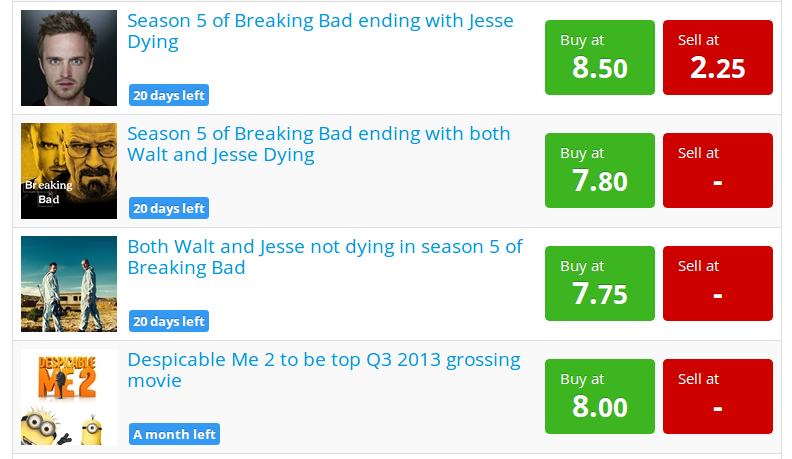 Unfortunately, as far as actual working prediction markets go, right now there are few options. The world leader in the industry, InTrade, shut down in March this year due to what appear to be internal "financial irregularities", and so far no other has stepped up to take its place. This, of course, presents a prime opportunity for Bitcoin, and one that a number of sites, most notably betsofbitco.in and bitbet.us, have already attempted to seize. Today, though, a new contender is opening its doors: Predictious. The difference: unlike the previous contenders, Predictious works like an actual prediction market. Betsofbitco.in and Bitbet attempt to serve the save function as Predictious, but in a very important way they are actually quite different. Rather than having users buy and sell shares, both sites use a betting system known as "parimutuel betting". Users bet on events by placing their money into the "yes" pool or the "no" pool for each event. Whichever side is ultimately correct will have the value of both pools redistributed them in proportion to how much they personally invested, with an additional weighting factor to encourage earlier bets. The problems with this approach are several. First, there is no way to "cash out" of one\\\\\\\\\\\\\\\\\\\\\\\\\\\\\\\\\\\\\\\\\\\\\\\\\\\\\\\\\\\\\\\'s bet in the middle. Second, the time weighting is impossible to balance perfectly; too little time-weighting, and users can "snipe" near-certain outcomes one minute before the deadline of a given event and make a substantial profit, and too much time-weighting means that it becomes impossible to tell what the market thinks is the probability of an event happening from the size of the pools. In Predictious, you bet for or against events by buying or short selling shares, and the price of a share always accurately reflects the market\\\\\\\\\\\\\\\\\\\\\\\\\\\\\\\\\\\\\\\\\\\\\\\\\\\\\\\\\\\\\\\'s opinion of the probability of a given event. Finally, parimutuel betting is simply unintiutive compared to the relatively simple concept of buying and selling shares in a market, which Bitcoin users are already used to in the form of Bitcoin exchanges. Predictious was created by Flavien Charlon, a developer with a prior background in mobile applications and Facebook applications, and is his first Bitcoin-related project. The parent company, Pixode, is based in Ireland, and the project is currently largely a solo effort - "although I am getting some help from a friend," Charlon points out. The site\\\\\\\\\\\\\\\\\\\\\\\\\\\\\\\\\\\\\\\\\\\\\\\\\\\\\\\\\\\\\\\'s interface is intuitive and easy to use. Users can look through the various predictions that the site offers listed by category (currently, the major categories are politics, sports, economics, entertainment, science and tech and business), and see the buy and sell prices listed beside each prediction. Each share pays out 10 mBTC if the underlying prediction proves true and 0 mBTC otherwise, so seeing a prediction with a price of 7 mBTC suggests that the market believes that the prediction has a 70% chance of coming true. There are two places to click on each prediction in the above view; on the left, one can click to view a more detailed contract, and on the right one can click in the "Buy" or "Sell" area to get to the trading screen. 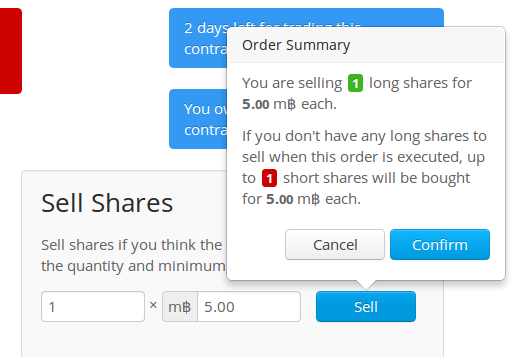 On the trading screen, the user sees a form that looks much like buying or selling bitcoins on an exchange; they set a quantity and a price they wish to buy or sell at, and click "Buy" or "Sell" to confirm the trade. If a matching offer exists (eg. you sell at 4.50 mBTC and someone is already buying at 4.80 mBTC), your offer gets matched up against the matching offer most favorable to you, and you either gain a share, lose a share, gain a negative "short share" or lose a short share depending on the kind of offer you made and your existing exposure. Short shares are what you get when you attempt to sell shares of a prediction without having any shares to sell; essentially, they are the inverse of an ordinary share. For example, short-selling a share for 3.00 mBTC will withdraw 7.00 mBTC from your account, and return 10.00 mBTC if the prediction proves to be false and 0 mBTC is it turns out to be correct. If a matching order does not exist, your order gets put in the order book, and hopefully soon enough someone else will take your offer. Predictious itself intends to earn its money by taking a fee, currently set at 0.2 mBTC per share on every transaction. We have now concluded the initial stages of our investigations about the financial status of the Company, and it appears that the Company is in a cash \\\\\\\\\\\\\\\\\\\\\\\\\\\\\\\\xe2\\\\\\\\\\\\\\\\\\\\\\\\\\\\\\\\x80\\\\\\\\\\\\\\\\\\\\\\\\\\\\\\\\x9cshortfall\\\\\\\\\\\\\\\\\\\\\\\\\\\\\\\\xe2\\\\\\\\\\\\\\\\\\\\\\\\\\\\\\\\x80\\\\\\\\\\\\\\\\\\\\\\\\\\\\\\\\x9d position of approximately US $700,000 when comparing all cash on hand in Company and Member bank accounts with Member account balances on the Exchange system....We are now very confident about the reasons which caused the current circumstance of the Company; however, for legal reasons we are not yet at liberty to document them to you. I can confirm that the Company, if it is able, intends to vigorously pursue two substantial monetary claims against two distinct parties for an aggregate amount greater than $3,500,000. Washington, DC \\\\\\\\\\\\\\\\\\\\\\\\\\\\\\\\xe2\\\\\\\\\\\\\\\\\\\\\\\\\\\\\\\\x80\\\\\\\\\\\\\\\\\\\\\\\\\\\\\\\\x93 The U.S. Commodity Futures Trading Commission (CFTC) today filed a civil complaint in federal district court in Washington, DC, charging Intrade The Prediction Market Limited (Intrade) and Trade Exchange Network Limited (TEN), Irish companies based in Dublin, Ireland, with offering commodity option contracts to U.S. customers for trading, as well as soliciting, accepting, and confirming the execution of orders from U.S. customers, all in violation of the CFTC\\\\\\\\\\\\\\\\\\\\\\\\\\\\\\\\xe2\\\\\\\\\\\\\\\\\\\\\\\\\\\\\\\\x80\\\\\\\\\\\\\\\\\\\\\\\\\\\\\\\\x99s ban on off-exchange options trading. The CFTC\\\\\\\\\\\\\\\\\\\\\\\\\\\\\\\\xe2\\\\\\\\\\\\\\\\\\\\\\\\\\\\\\\\x80\\\\\\\\\\\\\\\\\\\\\\\\\\\\\\\\x99s complaint also charges Intrade and TEN with making false statements concerning their options trading website in documents filed with the CFTC, and charges TEN with violating a 2005 CFTC cease and desist order (see CFTC Press Release 5124-05, October 4, 2005). Fortunately, Predictious is somewhat less vulnerable than InTrade to this kind of regulatory attack. In theory, both companies could simply sit in Ireland and remain unaffected by the law of a foreign country. In practice, however, the US very often gets its way. The major avenue of attack is through banking relationships; had InTrade not complied, the US may well have forced local banks to block, or even seize, transfers to Intrade, putting large hurdles before US residents wishing to use the site. This strategy is used already in the Foreign Account Tax Compliance Act, which has one clause requiring US-based banks to withhold 30% of all transfers sent to international institutions that do not comply with the act\\\\\\\\\\\\\\\\\\\\\\\\\\\\\\\\\\\\\\\\\\\\\\\\\\\\\\\\\\\\\\\'s core requirements. Predictious, on the other hand, does not need any banking relationships with anyone. However, this does not mean that Predictious will want to violate US law; if nothing else, the US has the power to produce an arrest warrant within their own country, effectively banishing Charlon from one third of the developed world. But, although Predictious eventually may not be able to avoid blocking the US, that is not where its advantage lies; rather, Predictious has no way of actually enforcing a country-based restriction. IP address-based blocks are possible, and often used in practice, but virtual private network (VPN) services like PrivateInternetAccess (which also accepts bitcoins) can easily be used to pretend to be from another country. SecurityKiss\\\\\\\\\\\\\\\\\\\\\\\\\\\\\\\\\\\\\\\\\\\\\\\\\\\\\\\\\\\\\\\'s VPN is even free for basic usage. As for Ireland\\\\\\\\\\\\\\\\\\\\\\\\\\\\\\\\\\\\\\\\\\\\\\\\\\\\\\\\\\\\\\\'s own laws, Charlon writes, "regulations around gambling in Ireland only apply to services dealing with currencies like Euros or Dollars, which we don\\\\\\\\\\\\\\\\\\\\\\\\\\\\\\\\\\\\\\\\\\\\\\\\\\\\\\\\\\\\\\\'t, so this may not even be coming into question before a few years." The idea of using Bitcoin as a currency not legally recognized as money in order to bypass regulations is not a new one; this was in fact the main legal premise of the gambling site SatoshiDice. However, in March 2013 FinCEN released a guidance stating that Bitcoin was indeed a form of virtual currency, and soon after that SatoshiDice decided that it was in their legal interests to start blocking IP addresses from the US (although circumventing that particular block is even more trivial; the SatoshiDice betting addresses have been copied to the Bitcointalk forums). In Ireland, nothing like this has happened - in fact, the country\\\\\\\\\\\\\\\\\\\\\\\\\\\\\\\\\\\\\\\\\\\\\\\\\\\\\\\\\\\\\\\'s government has not yet said a thing about the currency. Just like in the US, the situation may change, although arguably a pro-Bitcoin decision is more likely there. Hopefully, Predictious will remain untouched. Prediction markets are an application for Bitcoin that really should have had multiple stable providers since 2011; beyond the standard difficulties relating to security, they are not technically hard to implement, and fill a valuable niche in the Bitcoin ecosystem. Predictious, with the effort put behind it, stands a solid chance of finally succeeding where its predecessors have failed, especially as it will be helped along by the higher volume of the Bitcoin community in 2013. The one thing that is still lacking is a good set of predictions; currently, the predictions essentially all have to do with the 2016 US presidential election, celebrities, top grossing movies or the Bitcoin price; a wider array of predictions relating to science and technology or economics would likely be well received by the Bitcoin crowd. However, this is easily fixable; the site has a form where users can submit questions, and a manual review process will look through the inputs and include those that meet the site\\\\\\\\\\\\\\\\\\\\\\\\\\\\\\\\\\\\\\\\\\\\\\\\\\\\\\\\\\\\\\\'s quality standards. In the near future, the site will likely add graphs to track the price of particular shares over time, and adding new predictions will also be a top priority. Given the lack of any true competitors in the Bitcoin economy, and the lack of a solid established player since the loss of InTrade, Predictious has a unique opportunity to not just carve out a niche in the Bitcoin space, but also to bring a considerable amount of attention to Bitcoin itself. With enough community support, and luck, it may do just that.